Samsung is well-known for churning out a perplexing volume of phones and tablets, but it’s devices like the Galaxy Tab S that make us wish the company would just hunker down and focus on producing only the best. We’ve seen a multitude of tablets from Samsung in the last year, but it’s the new Tab S series, revealed Thursday, that finally stands out. Samsung calls this its flagship line of tablets, and has packed all the bells and whistles it could into 8.4- and 10.5-inch packages. The new Samsung slates will immediately be compared to Apple’s iPad and iPad mini, Google’s Nexus 7, Amazon’s Fire HDX devices, LG’s G Pad, and Microsoft’s Surface tablets. 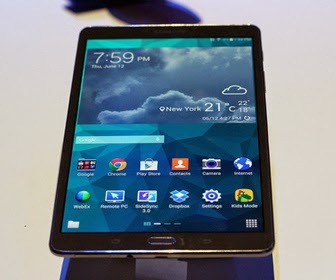 But in these two new releases, Samsung has definitely pegged what we need to see from an Android-powered tablet. Indeed—I like what I see so far. 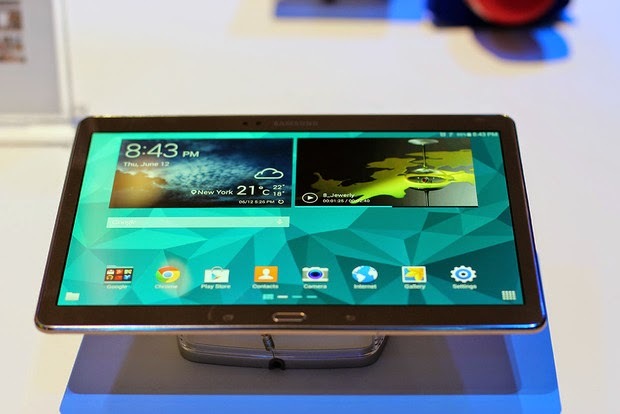 The 8.4-inch Galaxy Tab S is basically a larger reprise of its sibling, the Galaxy S5 smartphone. 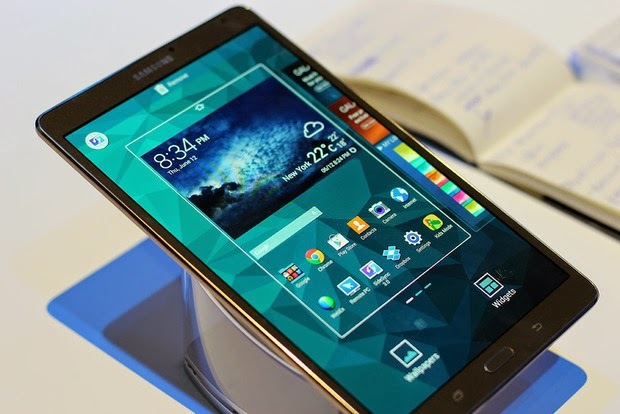 For the most part, the Galaxy Tab S is a tablety iteration of Samsung’s best phones. It has the same software and even the same physical elements. 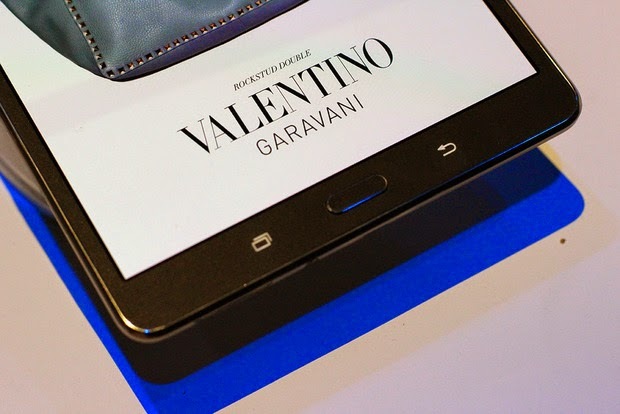 Think of it as an enlarged Galaxy S5, right down to the faux-leather, perforated backing. I like this material on an enlarged device size way more than on the Galaxy S5. The aesthetic, which recalls the look and feel of a writing journal, just works better for a device that you’d use for taking notes at a business meeting. 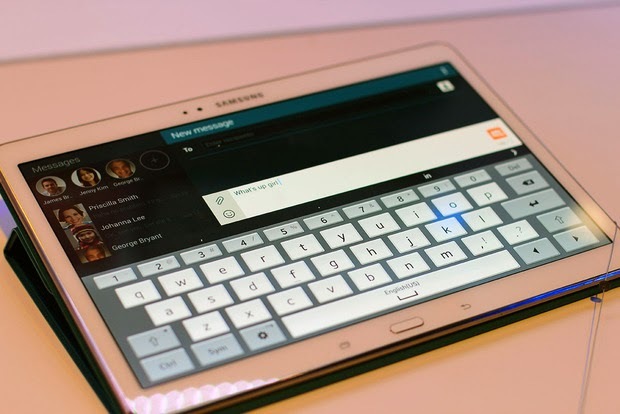 The 10.5-inch Samsung Galaxy Tab S.
It has the same navigational buttons of its predecessors. Both the 8.4-inch and 10.5-inch Galaxy Tab S tablets are larger than some of the other tablets on the market, but neither feels overpowering in the hand—perhaps this can be attributed to the relative lightness of each device. Samsung touted its high-resolution, color-accurate Super AMOLED display tech during most of its Thursday launch event at Madison Square Garden. 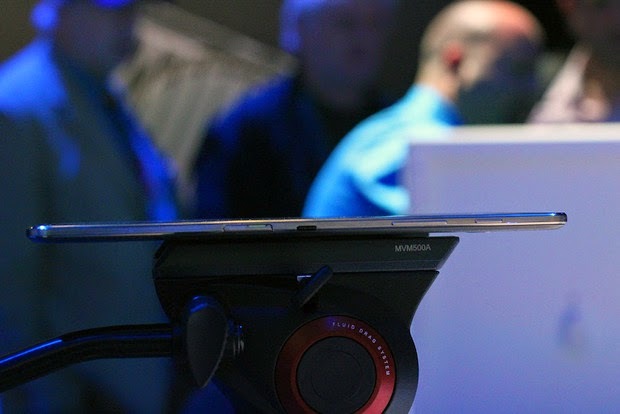 But the quality of Samsung’s technology was barely discernible when compared an iPad mini—which Samsung conveniently had on display at the event. I couldn’t do an extensive battery of A/B tests, but during my own anecdotal observations, I found that the iPad mini’s display looked only slightly washed-out and faded next to the Tab S twins’ high-contrast displays. On the left is an iPad mini, with slightly muted green tones, and on the right is the Galaxy Tab S, with more emerald coloring. Though the Galaxy Tab S’s Super AMOLED screens are vibrant and bright, I still feel the colors are a bit too saturated. That said, when compared to other displays side-by-side, Samsung’s color performance does look better, albeit maybe a bit too high on contrast. 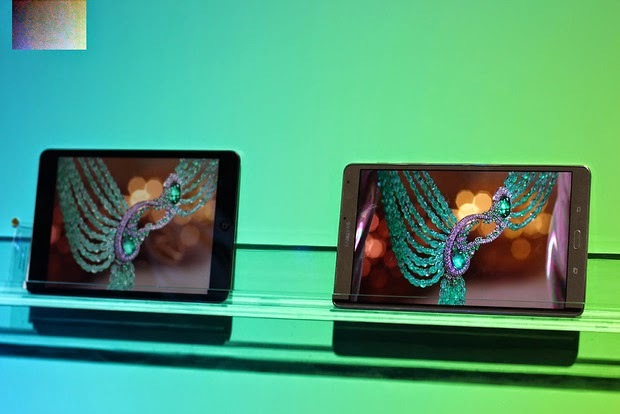 With a Snapdragon 800 SoC and 3GB of RAM, there’s no way that these tablets will bog down any time soon. 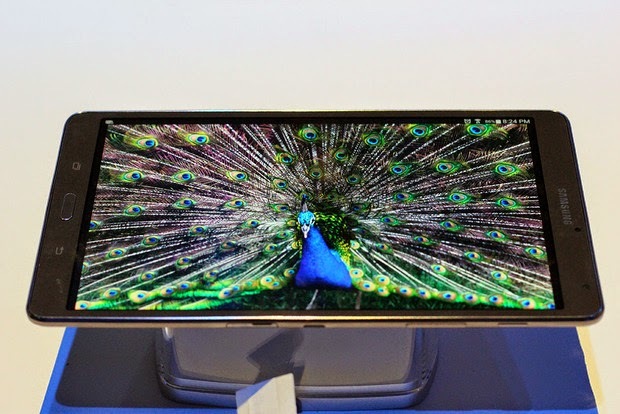 And that’s exactly what Samsung is aiming for, as it wants you to watch, and view, and read, and peruse, and basically do everything you could possibly do on this device. 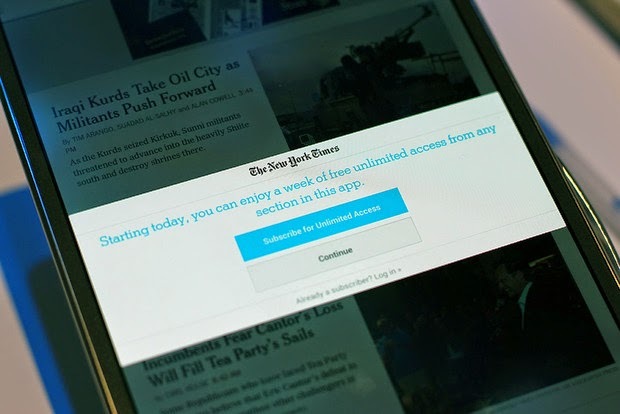 Try 12 weeks of the New York Times for free. To help you get started, Samsung is packing a ton of free stuff with the purchase of a Galaxy Tab S. You’ll get access to content like Marvel Unlimited and The New York Times. You’ll have access to regular Android apps for content, but the freebies will start the minute you launch the app. It’s Samsung’s way of enticing you to give its gadgets a try—and a way for the company to celebrate its connections with big-name content providers. 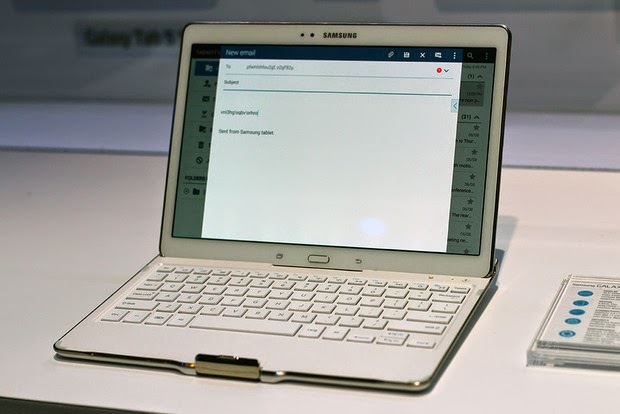 The keyboard add-on for the Galaxy Tab S is suprisingly comfortable to use. I liked the keyboard. It felt like one of Logitech’s various chiclet keyboard cases, and it was really, almost weirdly light. 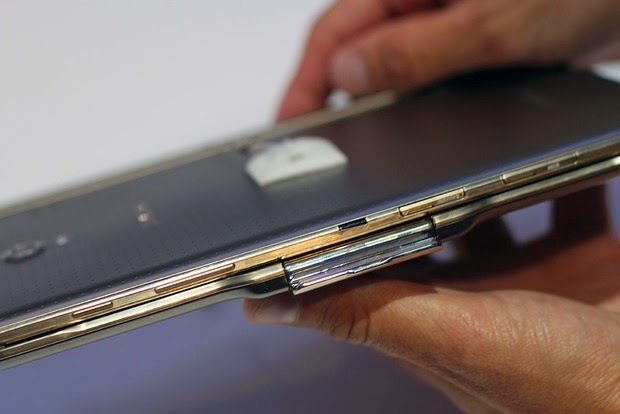 It also clasps closed on the Tab S like a makeup compact. It clasps closed like a vintage purse. The folio-like flip case, on the other hand, features three different modes. One of them props up the tablet for typing, one positions the tablet for watching movies, and the other lets you lay it flat. It’s a pretty standard folio-type case. 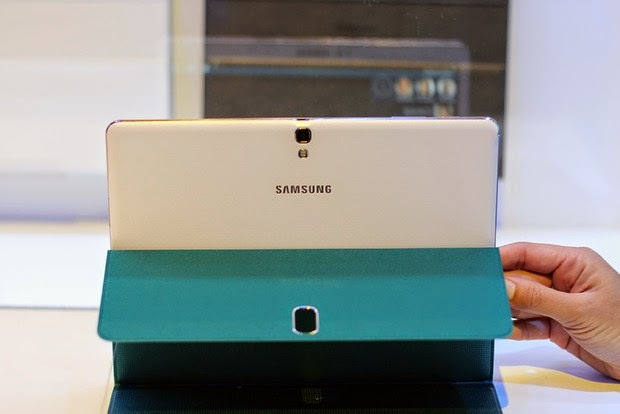 A comfortable typing angle with the Galaxy Tab S’s folio accessory. 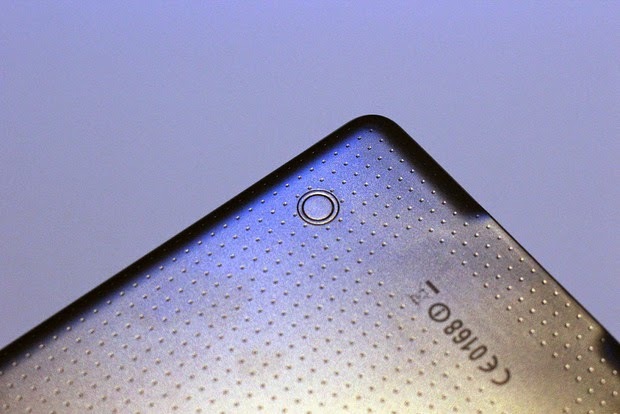 The flip cover snaps on to the back of the Tab S, clicking into interesting-looking divots. I wasn’t sure what they were at first, but a Samsung representative confirmed that the divots are waiting for the flip cover. 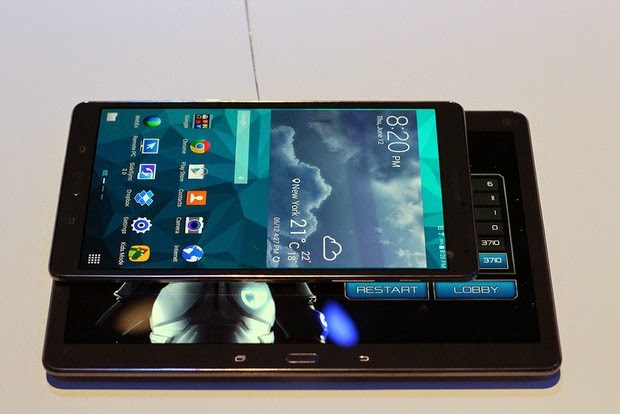 Clearly, Samsung wants you to buy this particular accessory. Where the folio cover snaps in. The folio cover is thin and folds into various positions. If you need the low down on specs and features, check out our earlier report. Samsung says the tablets should debut in July, with the 8.4-inch model costing $400, and the 10.5-inch model going for $500. Versions with LTE support will follow shortly after. We’ll have a full-blown review of one of the devices around then. If you like what you see, you can also pre-order the device right now.